I love Kaffir lime leaves. They impart a wonderful citrusy flavor and when they’re sliced finely and added to chicken curry, it brings the dish to a whole new level. 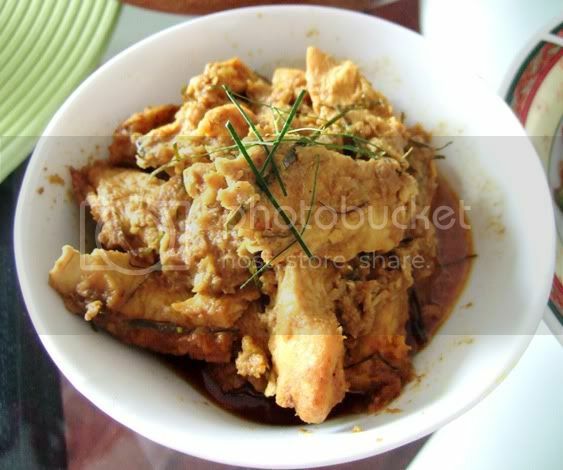 The lemony scent it gives off in this chicken gulai dish opens up the appetite of even the pickiest eaters. In case you’re wondering what gulai is, it essentially means curry. 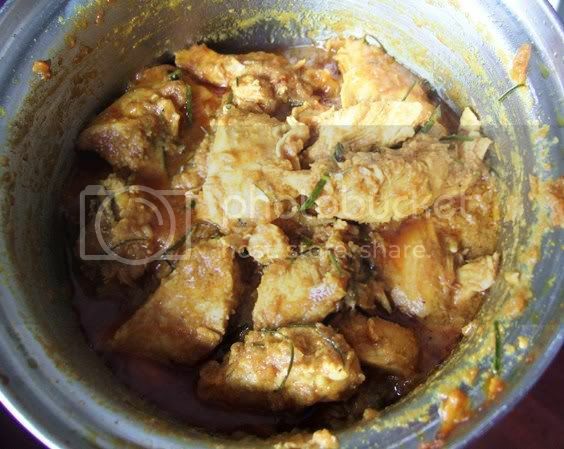 But in my understanding when gulai is made at home by my family, it usually has a citrusy tone to the curry with the addition of Kaffir lime leaves, lemongrass and/or juice of pineapples. This chicken gulai, besides the Kaffir lime leaves, I’ve also added pineapple juice to round off the flavor. It tastes very much like home. Actually this entire weekend has been like a trip down memory lane for my taste buds. 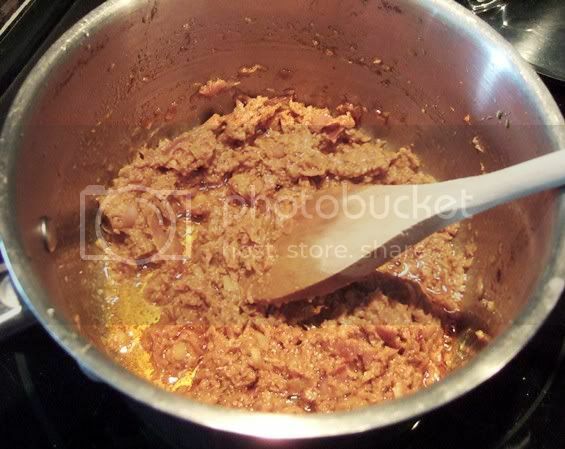 Heat oil in a pan and saute the spice paste until fragrant, 2-3 minutes. Add your chicken pieces in and stir first for a few seconds before adding the coconut milk and pineapple juice in. Let the concoction come to a simmer until chicken is cooked. Add Kaffir lime leaves and coconut cream. Season to taste with salt and mix well. As soon as the gulai starts to come to a boil again, turn heat off. 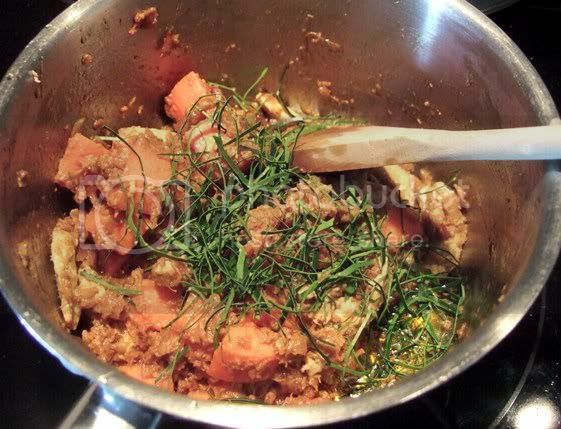 ***If you wonder why there are carrots in the gulai, the pictures are showing you the vegetarian version of the gulai during cooking period. The spices are exactly the same. Oh, this is also P’s first experience eating proper Nyonya food too. I’ve also made some onde-onde, a cousin to the mochi but it’s coated with grated coconut and stuffed with palm sugar that bursts in your mouth with sweetness. It possibly my favorite childhood Nyonya kueh, a Malaysian tea time snack. That recipe will come next! I likey, but I almost never make gulai kay from scratch. LOL. There's nothing like preparing all the ingredients for cooking this kari kay dish the traditional way. And when this kari kay is done, eating this dish the traditional way with rice using your five fingers makes this dish so much more delicious. Hmmm yummmy! Cook for me when I come visiting. I love curries of all kinds. I admit I have never had a Malay curry before. I will have to try it. Not sure I would have the patience to pound my own spice paste though lol. I miss chicken curries! This is a new twist for me. Thanks for sharing.